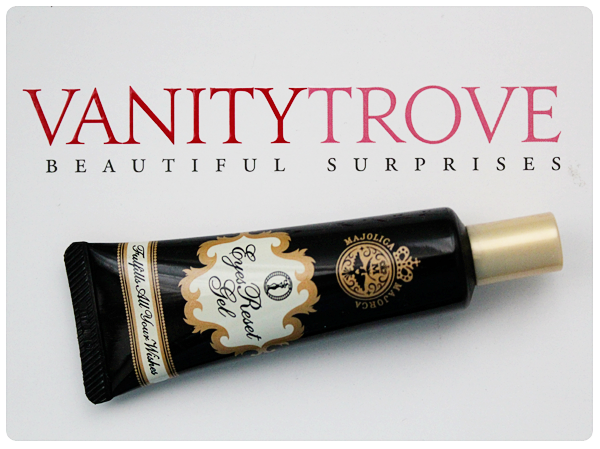 One of the darlings in my August's Vanity Trove is Majolica Majorca's Eye Reset Gel. I was pretty excited to try this out because the last time I used a Majolica Majorca product was 2 years back. The brand is known for their fairy tale-themed makeup collections but skin care products(I do consider makeup removers as part of skin care.)? I haven't really heard much of it. 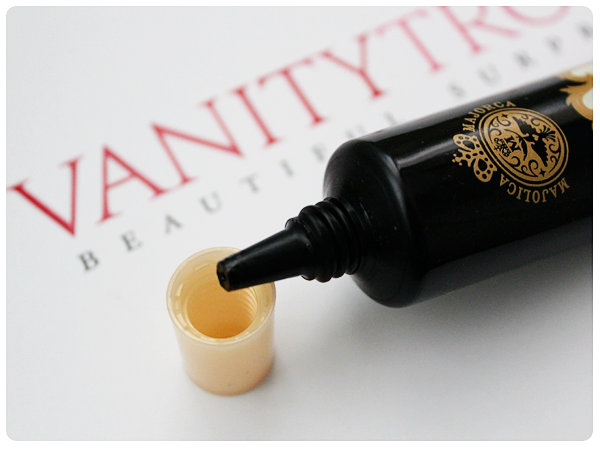 Just a quick recap, this is a gel-type remover that melts into oil for complete removal of eye makeup. The gel blends and binds with makeup with circular motions. In addition, the gel also helps to condition your eyelids so you can just wipe it away with tissue paper. The gel comes in a black, opaque 30g squeeze tube. I like that hygiene is taken care of; I only touch the amount I need and not the rest of the product. This is the case for most makeup removers. It is a pretty small tube and because you can just wipe it off without using water, it should come in handy when you find that your liner has given you panda eyes in the middle of the day (BUT I do have one gripe about it... Read on!). 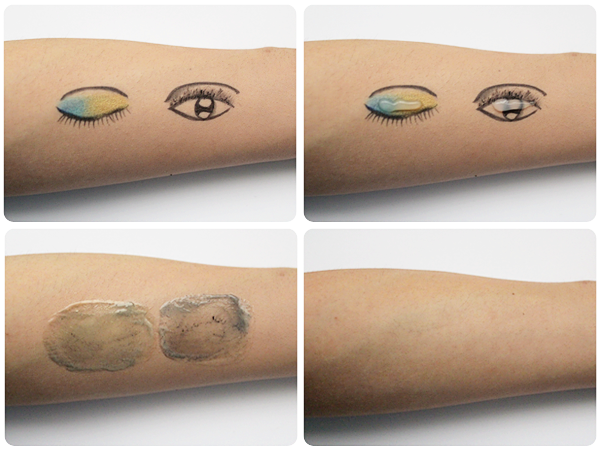 To test the gel's makeup removing skills, I have Etude House's Precious Mineral BB Cream, eyeshadows from Urban Decay's Deluxe Shadow Box, K-Palette's 24H Real Lasting Eyeliner (Super Black) and Shiseido's Defining Volume Perfect Mascara on my arm. Without wetting your hands or face, squeeze a pea-sized amount of the gel and apply it in circular motions on your eyelids. As aforementioned, you can either clean it off with a piece of tissue or wash it off with water. I have tried cleaning the gel off with a piece of tissue and washing it off with water. Both methods leave my eyelids feeling hydrated but it feels a tad greasy too, so I usually follow up with a cleanser. Majolica Majorca probably made the Eyes Reset Gel for her waterproof mascaras. Unfortunately, I haven't got any of her mascaras to try this on. The gel does do a decent job in removing my everyday makeup but I don't quite like the too-much-rubbing bit. It is also a tad troublesome for makeup that can be removed easily but I think this will be splendid for those Japanese notorious-for-being-difficult-to-remove mascaras.